Self locking quick connect/disconnect coupling, to STANAG 3756, for liquid media. 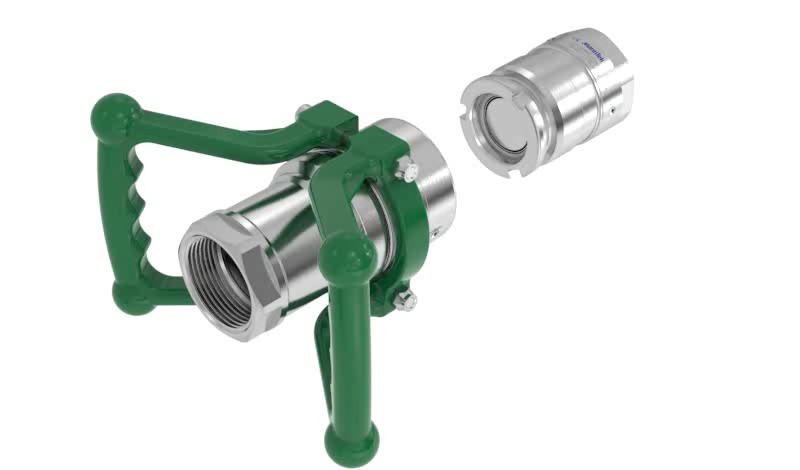 Description Hose unit with swivel, typically mounted on hose assemblies and loading arms for temporary connection to storage tanks and mobile transport units, for loading and unloading. Tank unit without swivel, typically fix mounted as filling connector on storage tanks, mobile tanks like IBC and ISO containers, road tankers, rail tank containers and ship manifolds. Comment Quick and safe connection of hose assemblies and loading arms to mobile and stationary tanks, under pressure and with minimised liquid loss. 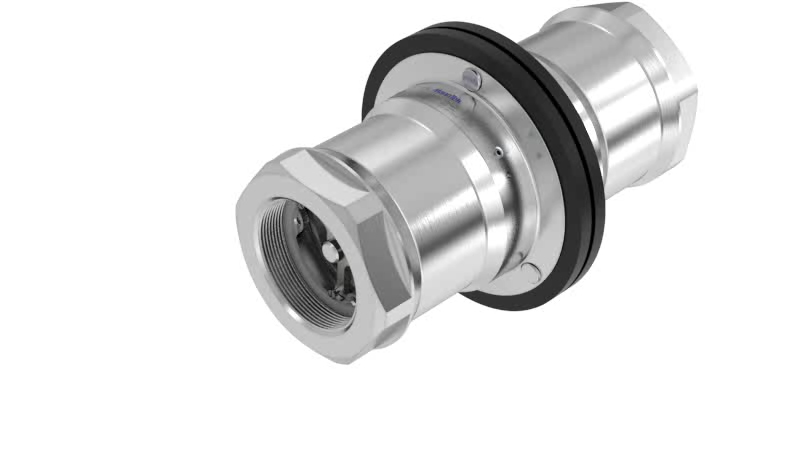 The standardised interface to STANAG 3756 with its bayonet coupling principle has been widely accepted in the industry. Both coupling parts are equipped with a flat poppet valve. For the connection, the hose unit is pushed onto the tank unit and coupled / sealed by turning the coupler clockwise by 15 degrees. When the unit is turned by 100 degrees, the valves move into the tank unit so that the medium can flow. When a similar turn is made counter-clockwise, the flow is stopped and the coupler can be pulled off. Sizes 1" (DN 25) up to 8" (DN 200). Connections BSP/NPT thread, DIN/ANSI/TW/TTMA flange – others on request. Pressure Can be coupled up to 7 bar line pressure. PEEK, PVDF = PN 6.
fulfilment of larger temperature range -50° C up to +200° C is possible - depending on medium, coupling and sealing material. Material Body: stainless steel (1.4401/1.4404, AISI 316 /316L, 1.4408/1.4409, CF-8M/CF-3M), aluminium or brass (up to 2") / bronze (from 2½") – others on request. O-Rings: Viton® (FPM/FKM) – others on request. 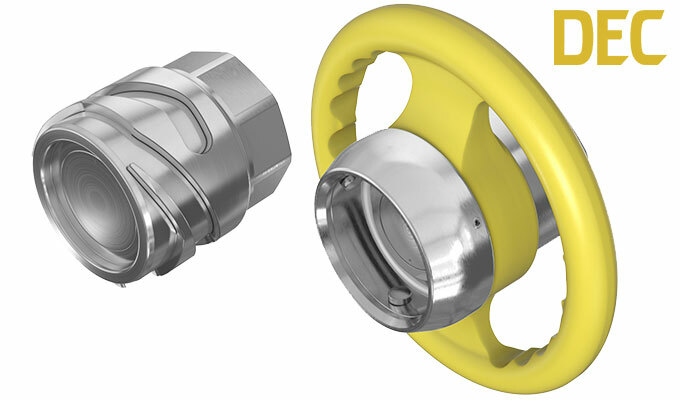 Flat seal (for female parallel thread connections only): PTFE (stainless steel couplings), PU (alu / brass (bronze) couplings) – others on request. 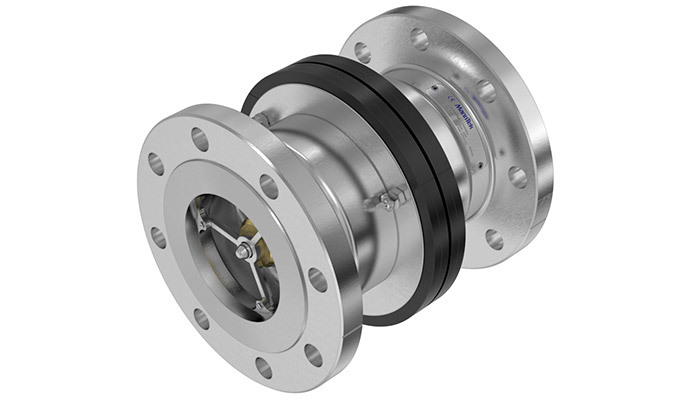 Approvals / Certificates DDC couplings fulfill the requirements of European Pressure Equipment Directive category 2 (for higher demand on request). They are suitable for the use in potentially explosive atmosphere (ATEX) zone 1, approved for the transport of dangerous goods on road (ADR), by rail (RID) and by ship (IMDG), specified as a branch standard from European Chemical Industry (CEFIC) for handling of Ethylene Oxide/Propylene Oxide, Acrylic Monomers, Acrylonitrile, polymeric MDI/TDI and Vinyl Chloride. 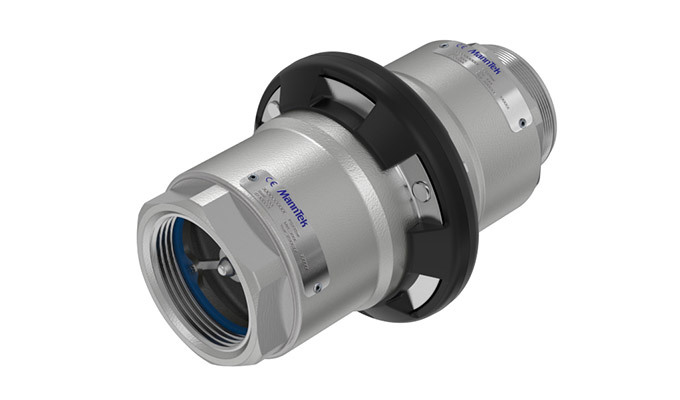 Self locking quick connect/disconnect coupling for aviation fuel, to ISO 45, MS24484 and STANAG 3105 - with 2½" bayonet connection. Description Hose unit with swivel, typically mounted on hose assemblies and loading arms for temporary connection between storage tank and mobile transport unit for loading and unloading. Tank unit without swivel, typically fix mounted as a filling connector on storage tanks, aviation refuellers and mobile tank containers. 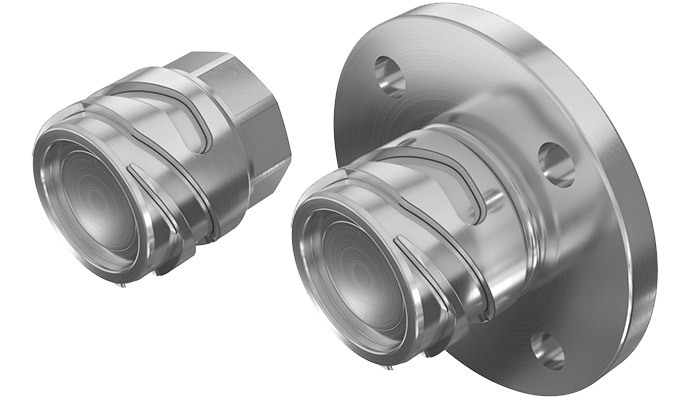 DAC couplings are suitable e.g. for bottom loading of aviation refuellers. They are not certified for underwing refuelling. 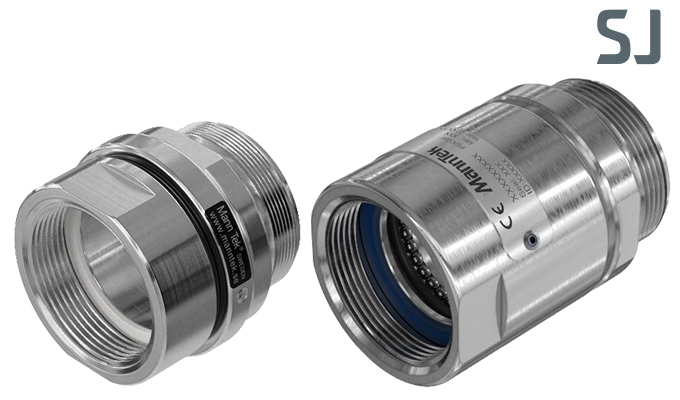 All wetted parts of the coupling are free from yellow metal such as brass/bronze, safeguarding media purity. Both coupling parts are equipped with a flat poppet valve. For the connection, the hose unit is pushed onto the tank unit and coupled / sealed by turning the coupler clockwise by 15 degrees. When the unit is turned by 100 degrees, the valves move into the tank unit so that the medium can flow. When a similar turn is made counter-clockwise, the flow is stopped and the coupler can be pulled off. Sizes 2½" (coupler diameter Ø 105 mm). Pressure Can be coupled up to 10 bar line pressure. Temperature -20° C up to +55° C; (low temperature version down to -55° C available). Flat seal (for female parallel thread connections only): polyurethane – others on request. 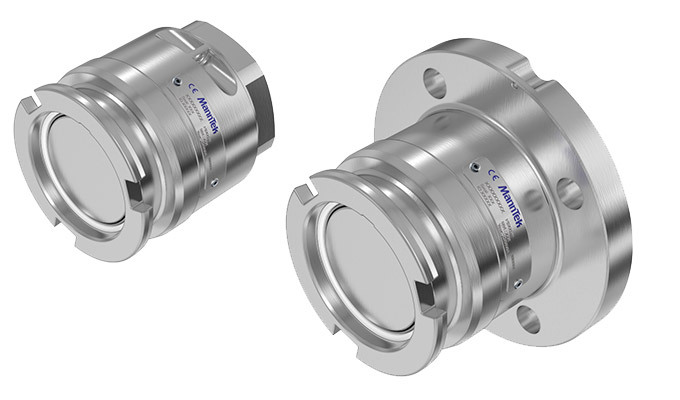 Approvals / Certificates DAC couplings fulfill the requirements of European Pressure Equipment Directive category 2. They are suitable for the use in potentially explosive atmosphere (ATEX) zone 1, approved for the transport of dangerous goods on road (ADR) and by rail (RID). 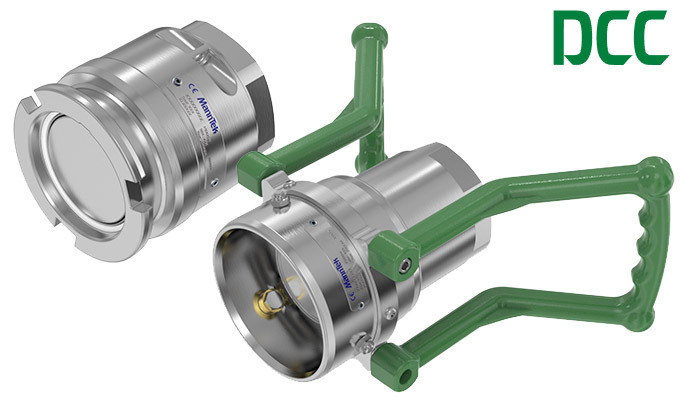 Self locking quick connect/disconnect coupling for aviation fuel, to EN 13760 / EN 13175, for the loading and unloading of liquefied petroleum gas LPG and various other media. Description Hose unit with swivel, typically mounted on hose assemblies and loading arms for temporary connection to storage tanks and mobile transport units. Tank unit without swivel, typically fix mounted as filling connector on storage tanks, mobile tanks, road tankers, rail tankers, containers and ship manifolds. DN 25 as LPG fuelling connector for heavy duty vehicles to EN 13760. DN 50 as LPG filling connector for trucks on liquid line or as vapor return on railcars to EN 13175 up to +80° C.
DN 80 as connector for railcars on liquid line to EN 13175. Pressure Working pressure PN 25. 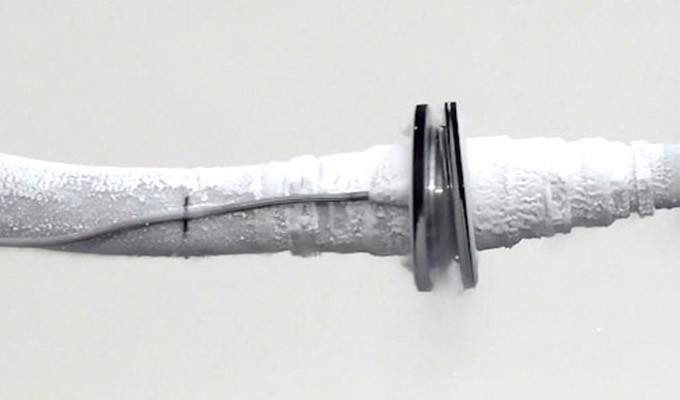 Temperature -40° C up to +80° C, depending on O-Ring material. Material Body: stainless steel – depending on type/size 1.4401 (AISI 316), 1.4404 (AISI 316L), 1.4408 (CF-8M) or 1.4409 (CF-3M). O-Rings: Viton® (FPM LT/FKM LT) – others on request. 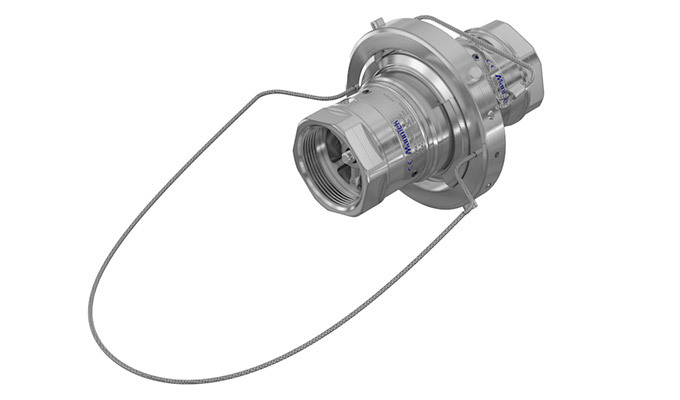 Approvals / Certificates DGC couplings fulfill the requirements of European Pressure Equipment Directive category 2 (for higher demand on request). They are suitable for the use in potentially explosive atmosphere (ATEX) zone 1, approved for the transport of dangerous goods on road (ADR), by rail (RID) and ship (IMDG). Specified as a fuelling connector for DME driven vehicles. Also suitable for other liquefied gases like ammonia, ethylene, propylene, butadiene and others. 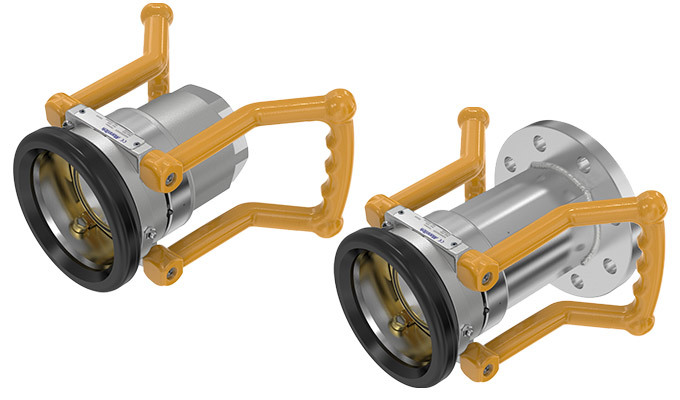 Safety Breakaway Couplings (Emergency Release Couplings) with integrated shut-off valves are used to avoid spillage and damage associated with drive and/or pull away incidents when loading and unloading. The couplings are designed to be the weakest link of the hose line or loading arm. Suitable for a wide range of products including petroleum based products, chemicals and foodstuffs. Used to protect hose assemblies and loading arms against excessive loads, e.g. due to drive/pull away incidents or rapid removal of the mobile tanker in emergency situations. Typical applications include container discharge, fuel bunkering truck-to-ship, ship-to-ship, terminal-to-ship, loading/unloading of tank trucks, rail tankers and ships. Designed with breaking bolts; activation at a defined tensile (pulling) force on the transfer line being applied, either straight or at an angle. Installation between a hose assembly or loading arm and a fixed point, e.g. pipe system, rail tanker or road tanker connection. Release by pull at any angle up to 90 degrees. SBC 'Industrial Type' have thre external breaking bolts. Breaking forces (release forces) are calculated on the basis of the working pressure of the system in Question. Standard breaking forces for SBC are calculated to protect a mating hose with a burst pressure 4 times WP. To protect hoses with other burst pressure specification or adjacent equipment which may be weaker than the hose please contact your sales representative who will provide a design guideline or can forward your special request to the MannTek technical department. If the transfer line is subjected to inadvertent and strong tensile loads, e.g. due to a premature movement or the drifting of ships / barges, the coupling will separate and instantly seal the two open ends. It can be reassembled on site with a set of spare parts. Used to protect hose assemblies against excessive loads, e.g. due to pull away incidents or rapid removal of the vessel in emergency situations. Typical applications are ship to rig and ship to ship media transfers. Typical applications include container discharge, fuel bunkering truck-to-ship, ship-to-ship, terminal-to-ship. Designed with breaking bolts; activation at a defined tensile (pulling) force on the transfer line being applied applied axially. In comparison to the 'Industrial Version' the coupling offers an increased resistance to torsion and bending loads to prevent unwanted separation. SBC 'Marine-Version' have thre external breaking bolts. Breaking forces (release forces) are calculated on the basis of the working pressure of the system in question. Used to protect hose assemblies against excessive loads. Special type, recommended in transfer systems with the combination of high operating pressure and weak piping structure. 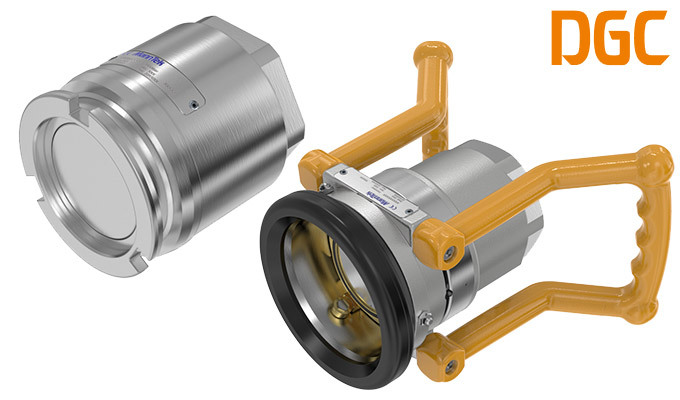 Compared with standard Safety Break Couplings with breaking bolts SBC-C are designed with a clamp system and an external collar with an attached cable. The tensile force (pulling force) is not transmitted via the hose or loading arm, but by an integrated cable which is attached to a fixed point (pipework, rail tanker or road tanker). The length of the cable is adjusted slightly shorter than the maximum length of the loading line. Release forces are almost independent from the internal pressure (working pressure). After the admitted travel limit of the cable is reached (angle up to 90 degrees), only a small pull is sufficient to actuate the separation. If the cable reaches the admitted travel limit and a defined pulling force, the external colllar is pulled off and clamps are actuated; the coupling will separate and instantly seal the two open ends. There are no loose components which can get lost. After separation the coupling is checked and can be reconnected without spare parts or special tools. SBC-C 2" (DN 50) up to 6" (DN 150). Material Body: either stainless steel (1.4401 (AISI 316), 1.4404 (AISI 316L), 1.4408 (CF-8M), 1.4409 (CF-3M)), aluminium or brass – others on request. 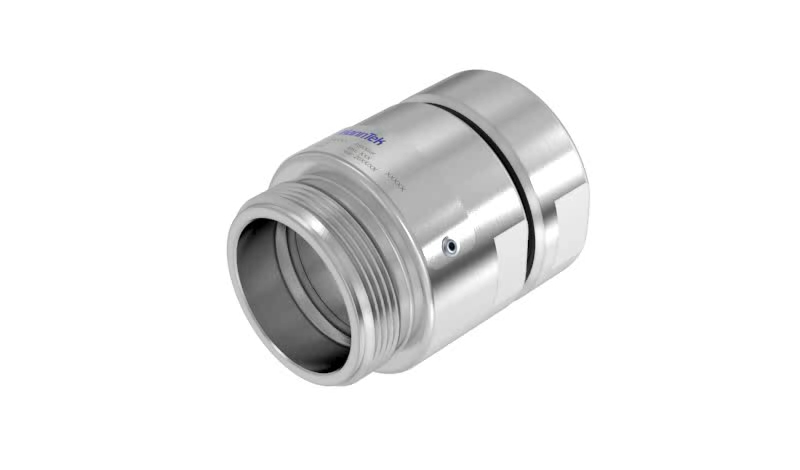 Flat seal (for female parallel thread connections only): PTFE (stainless steel couplings), PU (aluminium and brass couplings) – others on request. Breaking bolt types: breaking bolts of stainless steel. 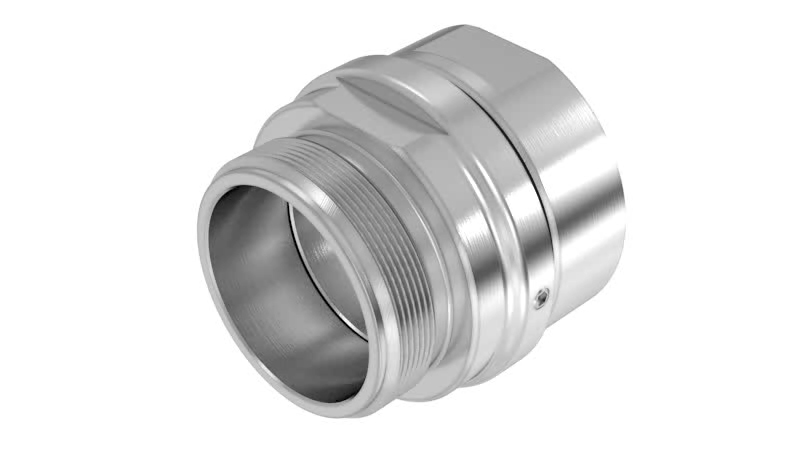 Cable release type: supplied with a stainless steel pull cable attached to the collar of the coupling. The required secondary cable as connection to a fixed point is not supplied. Approvals / Certificates SBC and SBC-C SBC-C fulfill the requirements of European Pressure Equipment Directive category 2 (for higher demand on request). Suitable for the use in potentially explosive atmosphere (ATEX) zone 1. Approved for the transport of dangerous goods on road (ADR), by rail (RID) and by ship (IMDG). 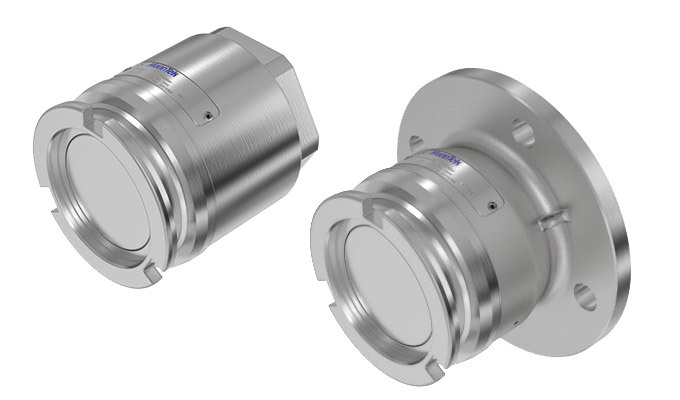 Self locking quick connect/disconnect coupling, to PED 2014/68/EU 4.3 and ATEX 2014/34/EU Category 3G, for liquid media and liquefied gases. 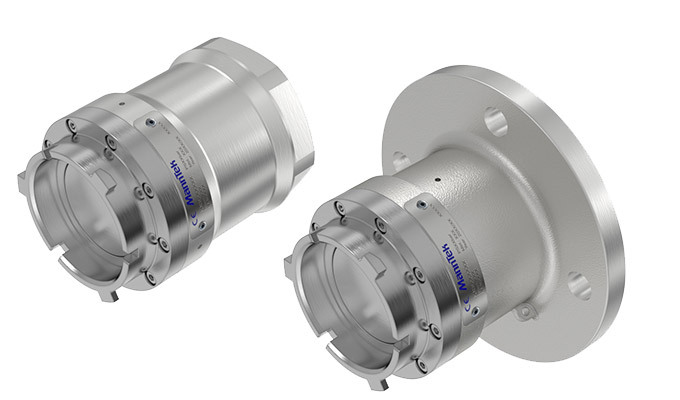 Dry Evotek Couplings (DEC) are a new generation of dry couplings which have been developed especially for use in the chemical industry. Tank unit without swivel, typically fix mounted as filling connector on storage tanks, IBC and ISO mobile tanks, road tankers and rail tankers. Compared with other dry couplings, all elements of the coupling mechanism are accomodated at the exterior part which is not in contact with the medium. Due to this optimisation of dead spaces only a very small amount of medium can collect within the coupling. This results in a very good draining ability and a clearly minimised risk of media contamination. The exterior positioning of the coupling mechanism also facilitates the cleaning process and the lifetime of the coupling. Both coupling parts are equipped with a flat poppet valve. For the connection, the hose unit is pushed onto the tank unit and coupled / sealed by turning the coupler clockwise by 10 degrees. When the unit is turned a further 120 degrees, the valves axially move witin the enlarged cross section of the tank unit for full medium flow. Wen a similar turn is made counter-clockwise, the flow is stopped and the coupler can be pulled off. 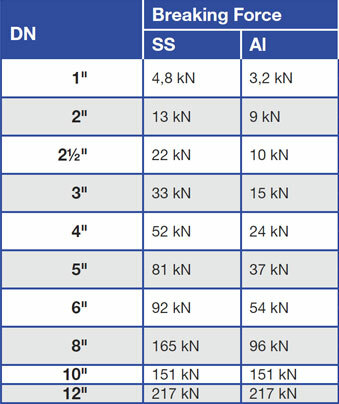 Sizes 1" (DN 25) · 1¼" (DN 32) · 1½" (DN 38) · 2" (DN 50) · (3" (DN 80) in preparation). Connections BSP thread, EN 1092 (DIN) flange – others on request. Material Body: stainless steel 1.4404 (AISI 316L), Hastelloy – others on request. O-Rings: Viton® (FPM/FKM), NBR, NBR Low Temperature, FFKM – others on request. 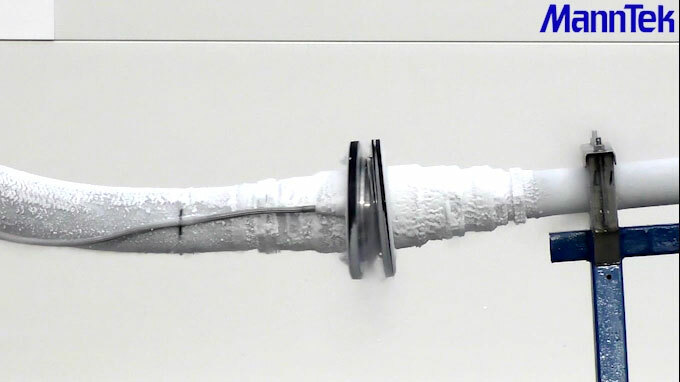 Flat seal (for female parallel thread connections): PTFE. Approvals / Certificates PED 2014/68/EU 4.3 and ATEX 2014/34/EU Category 3G. Material conformity to FDA or USP requirements for pharma and foodstuff applications can be confirmed on request. 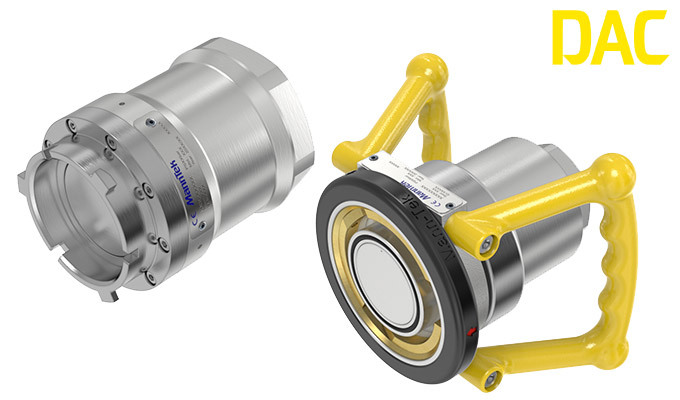 Self locking quick connect/disconnect coupling, to ISO TS 18683. Suitable for the loading and unloading of cryogenic liquefied gases (LNG, nitrogen, oxygen, argon, ethylene etc.) down to -196° C.
e.g. for container discharge, fuel bunkering, loading/unloading of tank trucks, rail tankers and ships. Tank unit without swivel, typically fix mounted as filling connector for container discharge, fuel bunkering truck-to-ship, ship-to-ship, terminal-to-ship, loading/unloading of tank trucks, rail tankers and ships. Comment Quick and safe connection of hose assemblies and loading arms to mobile and stationary tanks, under pressure and with minimised product loss. During the cool down phase no retightening of the connection is necessary as practiced with flanged or threaded connections. Both coupling parts are equipped with a flat poppet valve. For the connection, the hose unit is pushed onto the tank unit and coupled / sealed by turning the coupler clockwise by 15 degrees. When the unit is turned by 100 degrees, the valves move into the tank unit so that the medium can flow. When a similar turn is made counter-clockwise, the flow is stopped and the coupler can be pulled off. Sizes 1" (DN 25) up to 6" (DN 150). Connections NPT thread, DIN/ANSI flange – others on request. Temperature -196° C up to +85° C.
Material Body: stainless steel 1.4404 (AISI 316L). Approvals / Certificates DCC couplings fulfill the requirements of European Pressure Equipment Directive category 2 (for higher demand on request). Suitable for the use in potentially explosive atmosphere (ATEX) zone 1. Approved for the transport of dangerous goods on road (ADR), by rail (RID) and by ship (IMDG) and EN 14432. Type approval to DNV GL rules for Liquefied gas carriers, Type examination DNV GL for LNG transfer systems (ISO16904, EN1474-3). 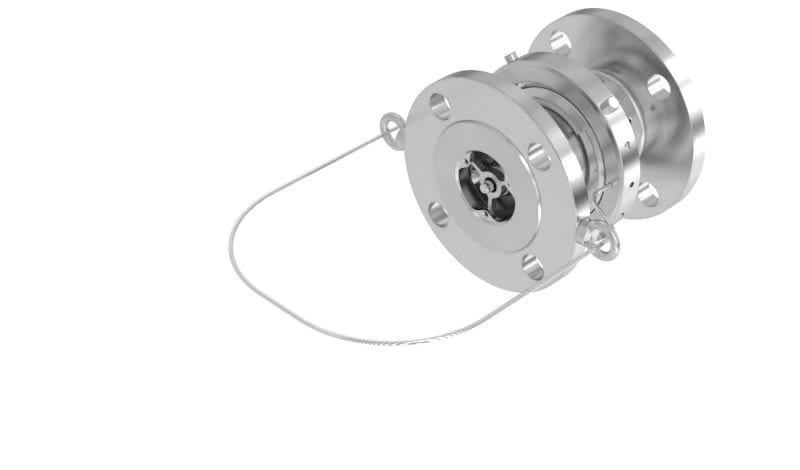 Suitable for cryogenic liquefied gases (LNG, nitrogen, oxygen, argon, ethylene etc.) down to -196° C.
CBC 'Industrial Type' have three external breaking bolts. Breaking forces (release forces) are calculated based on the working pressure of the system in question. Typical applications include container discharge, fuel bunkering and loading operations truck-to-ship, ship-to-ship, terminal-to-ship. Designed with breaking bolts; activation at a defined tensile (pulling) force on the transfer line being applied axially. 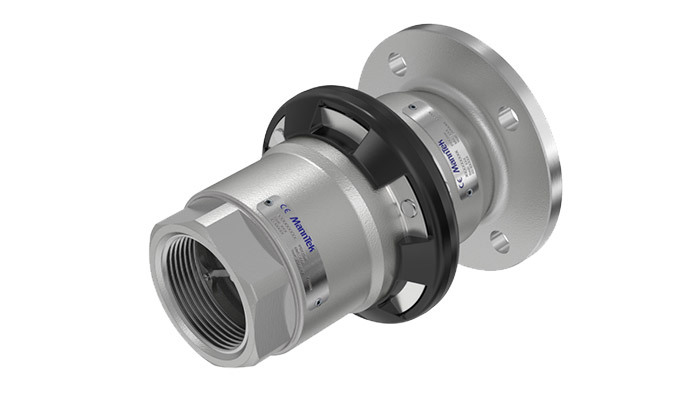 In comparison to the 'Industrial Version' the coupling offers an increased resistance to torsion and bending loads to prevent unwanted separation. CBC 'Marine-Version' have three external breaking bolts. Breaking forces (release forces) are calculated based on the working pressure of the system in question. 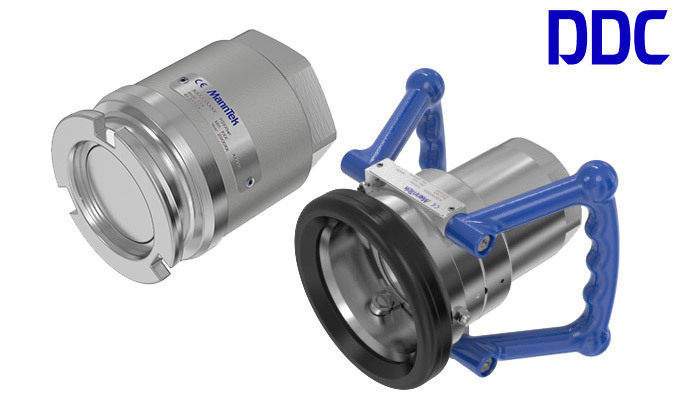 Compared with standard Safety Break Couplings with breaking bolts CBC-C are designed with a clamp system and an external collar with an attached cable. If the cable reaches the admitted travel limit and a defined pulling force, the external collar is pulled off and clamps are actuated; the coupling will separate and instantly seal the two open ends. There are no loose components which can get lost. After separation the coupling is checked and can be reconnected without spare parts or special tools. 'Powered Emergency Release Coupling' with remote controlled release, additionally passive release as safety backup. Used to protect hose assemblies and loading arms against excessive loads, and for manual release in emergency situations. 2) At a defined tensile (pulling) force on the transfer line being applied at an angle of up to 90 degrees. Suitable for the transfer of cryogenic liquefied gases (LNG, nitrogen, oxygen, argon, ethylene etc.) down to -196° C.
Typical applications include container discharge, fuel bunkering truck-to-ship, ship-to-ship, terminal-to-ship, loading/unloading of ships. CBC-PERC is a powered version of the CBC with the advantage that it can be released by external overload or manually operated. In case of a remote controlled release, a Nitrogen gas cylinder will be opened and gas pressure will release the breaking bolts. CBC-PERC systems require consultation between a MannTek project manager and the operator during the entire planning phase, including risk analysis (RA, HAZOP, HAZID). CBC-PERC 4" (DN 100) up to 8" (DN 200). Connections NPT thread, DIN/ANSI/TTMA flange – others on request. DN ≥ 150: PN 16. Approvals / Certificates CBC and CBC-C fulfill the requirements of European Pressure Equipment Directive category 2 (for higher demand on request). Approved for the transport of dangerous goods on road (ADR), by rail (RID) and by ship (IMDG). Type approval DNV GL rules for Liquefied gas carriers, type examination DNV GL for LNG transfer systems (ISO16904, EN1474-3). CBC-PERC: Type approval DNV GL rules for liquefied gas carriers, type examination DNV GL for LNG transfer systems (ISO16904, EN1474-3). DNV GL TAP00000X6, DNV GL TAP000012W, Lloyd’s Register 0038 RET0271208. 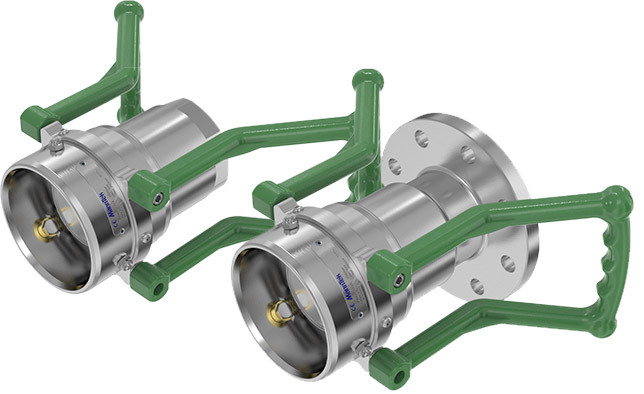 Ball valves for road tankers and aviation refuellers / dispensers. Suitable for mineral oil products. 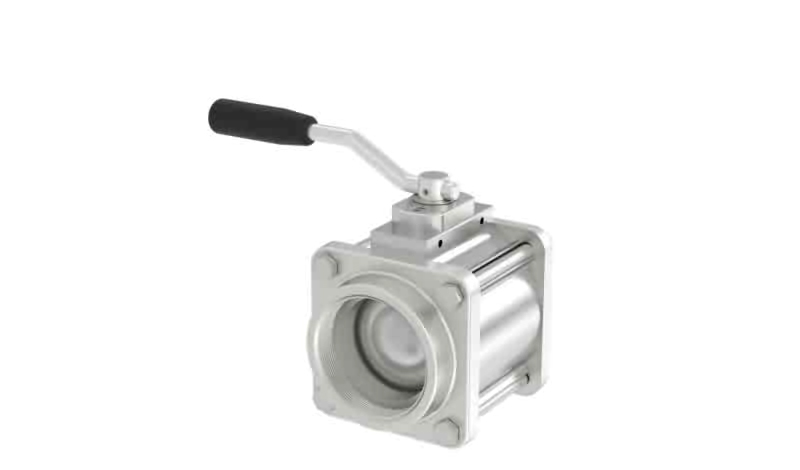 One way ball valve - one inlet and one outlet (manual or pneumatic actuation). Two way ball valve - One inlet, two outlets (manual or pneumatic actuation). Media flow in both directions possible. 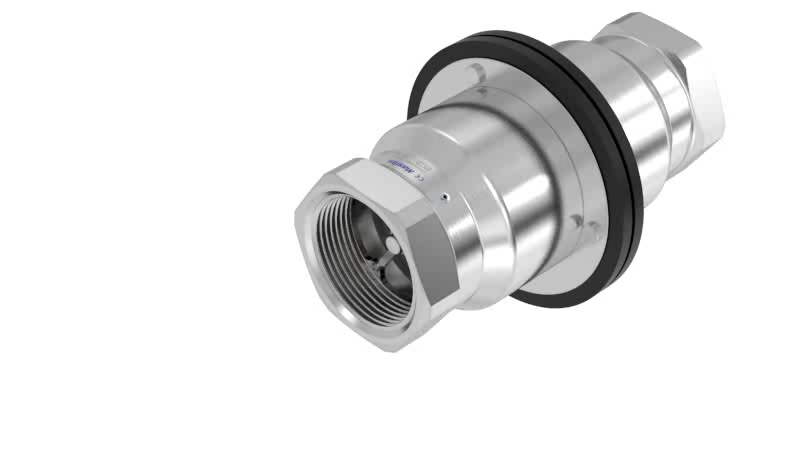 Comment Compact and lightweight construction with full flow (low pressure drop). Suitable for the handling of different types of petroleum based products such as diesel, gasoline and aviation fuels. May also be used for other media, e.g. solvents. All wetted parts of the ballvalve are free of non-ferrous metal such as brass/bronze, safeguarding media purity. 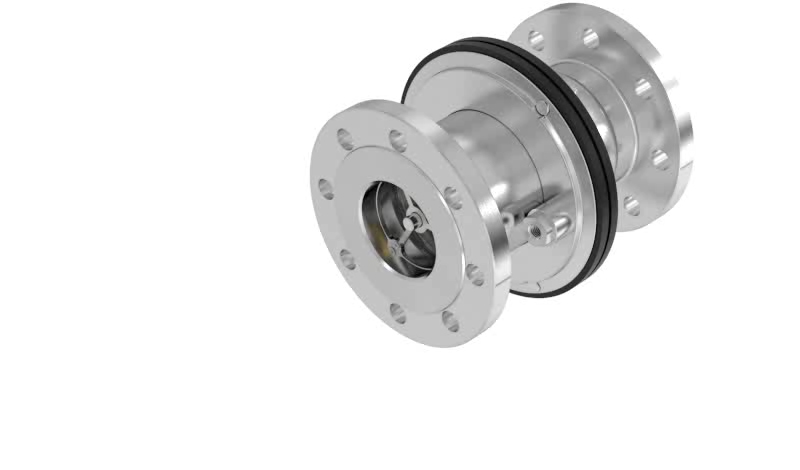 Typically mounted as closing valve / manifold in filling and supply (unloading) lines on road tankers, aviation refuellers and dispensers and other mobile fuelling applications, e.g. pump skids and tank containers with integrated dispenser. 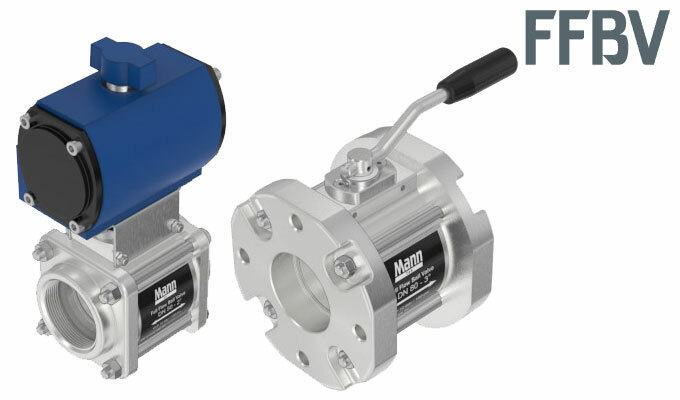 Two way ballvalves are suitable as a second closure to ADR on tank trucks. 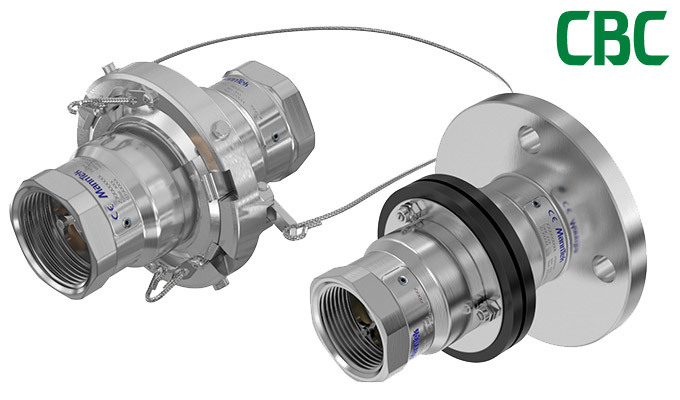 They are not certified as an Internal Regulating Valve (ILV) as specified in SAE AS6401. Sizes 2" (DN 50) up to 4" (DN 100). Any combination for both sides possible. Pressure Working pressure PN 10. Temperature Temperature range -30° C up to +55° C; (low temperature type down to -48° C available). O-Rings: FKM – others on request. 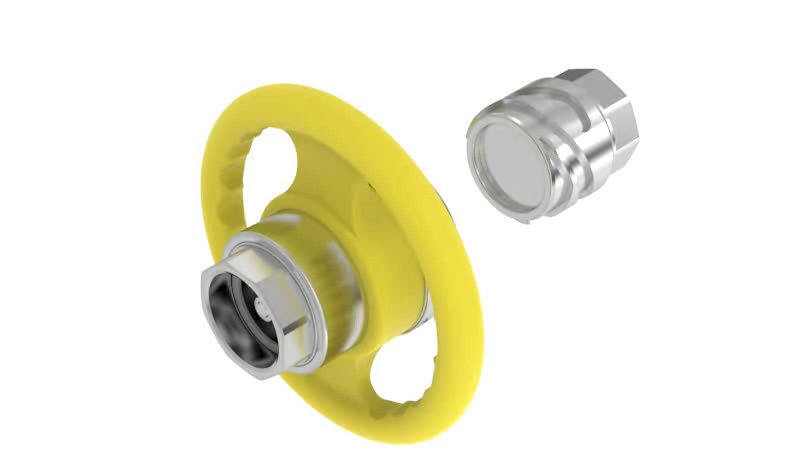 Flat seal (for ball valves with female parallel thread connections only): polyurethane – others on request. Approvals / Certificates Approved for the transport of dangerous goods on road (ADR) and by rail (RID). Type examination according to EN 14432. One of the main causes of failure in fluid transfer systems is torque stress (torsion) between two equipment parts. The compact MannTek Swivel Joints help to avoid this. Their use will extend hose life and avoid premature failure of the hose assembly. Suitable for a wide range of liquid and gaseous media including petroleum based products, chemicals and foodstuffs. 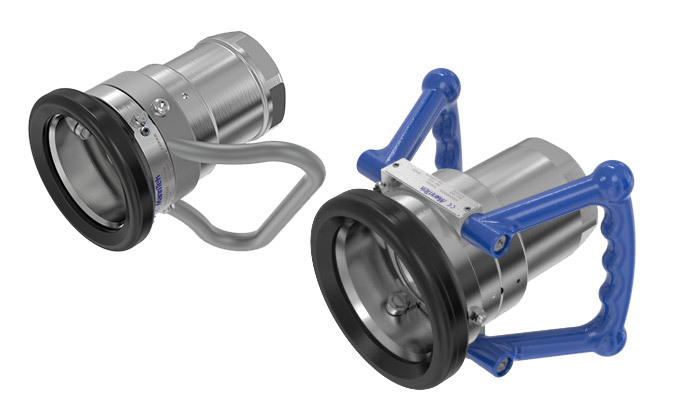 allows free rotation between hose assembly and attached handling equipment such as filling nozzles. Standard duty Swivel Joints are used e.g. in filling plants to avoid torsion of hose assemblies and improve the handling and coupling of nozzles if no integrated swivel is attached. One capsulated ball bearing and PTFE bearing. Electrically conductive. 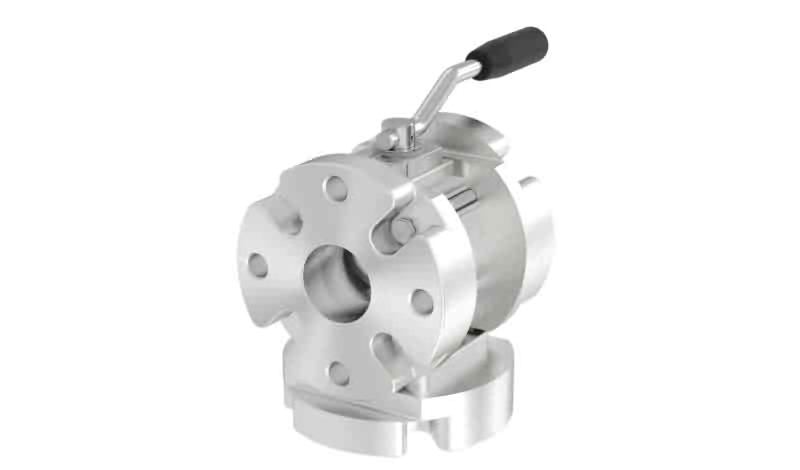 Designed to allow smooth rotation (slow rotary movement) of operating devices such as filling nozzles. Not certified to bear side loads or high bending moments; for high bending movements, please use 'heavy duty' Swivel Joints. Available sizes ¾" (DN 19) up to 4" (DN 100). 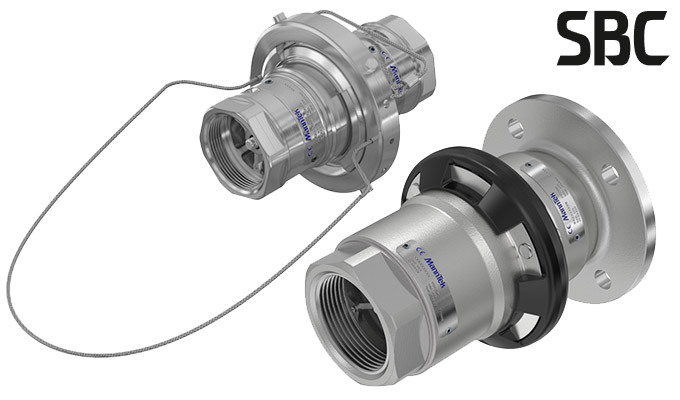 allows free rotation between hose assembly and the fixed point of a plant / pipe system, e.g. tank truck or rail tanker connection. Heavy duty Swivel Joints are designed especially for hose reels to load and unload products where high bending forces can occur - e.g. offshore hose reels ship-to-shore, oil platform loading rigs, hoses for road and rail tankers. Two capsulated ball bearings. Electrically conductive. Designed to allow smooth rotation (slow rotary movement) of hose assemblies which are attached to a fixed point of the pipework, e.g. rail tanker or tank truck connection. Suitable to bear high bending moments. Do not use for strong side loads directly on the swivel. Available sizes 2" (DN 50) up to 10" (DN 250). Stainless steel, Hastelloy, Titanium = PN 25.
fulfillment of larger temperature range -50° C up to +200° C is possible - depending on medium, coupling and seal material. Material Body: choice of stainless steel (1.4401 (AISI 316), 1.4404 (AISI 316L)), aluminium or brass – others on request. 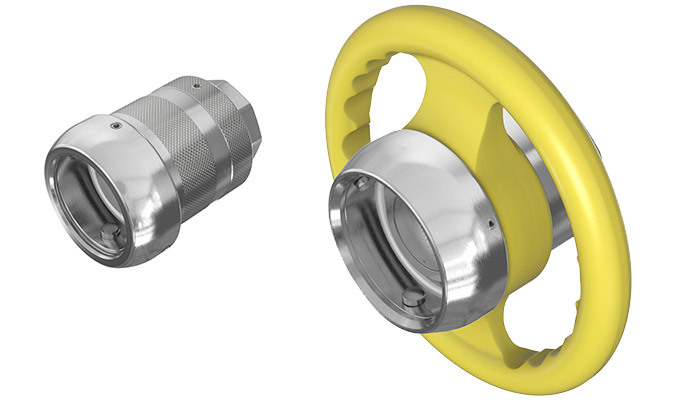 Flat seal (for female parallel thread connections): PTFE (stainless steel couplings), polyurethane (aluminium / brass couplings) – others on request. Sample of a MannTek ID Plate. 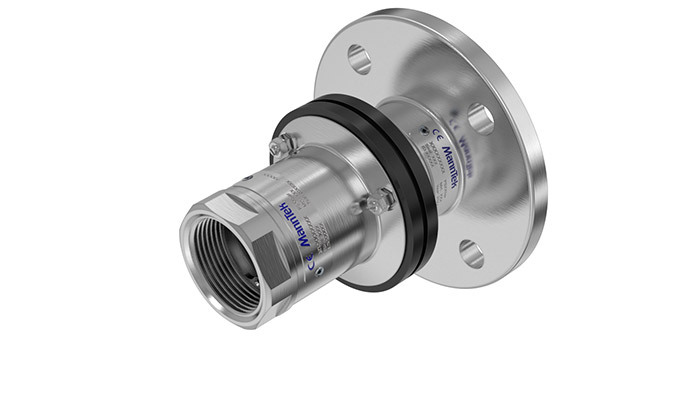 To simplify re-orders type in the existing MannTek part number. Description Self locking quick connect/disconnect coupling, to STANAG 3756, for liquid media. Hose unit with swivel, typically mounted on hose assemblies and loading arms for temporary connection to storage tanks and mobile transport units, for loading and unloading. 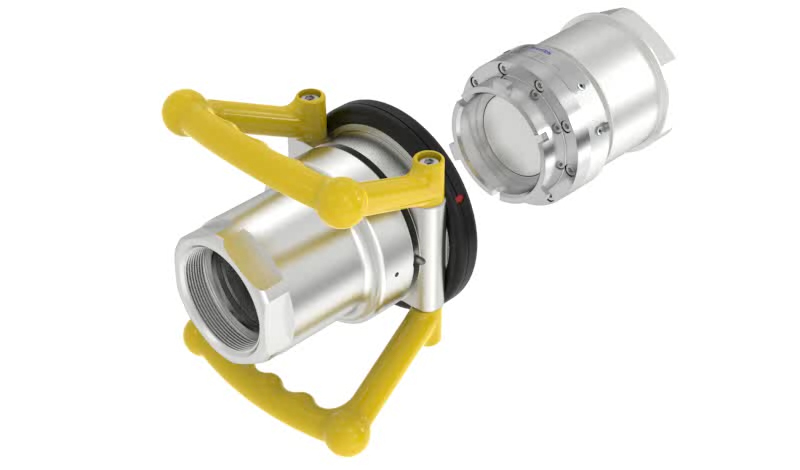 Description Self locking quick connect/disconnect coupling for aviation fuel, to ISO 45, MS24484 and STANAG 3105 - with 2½" bayonet connection. Hose unit with swivel, typically mounted on hose assemblies and loading arms for temporary connection between storage tank and mobile transport unit for loading and unloading. 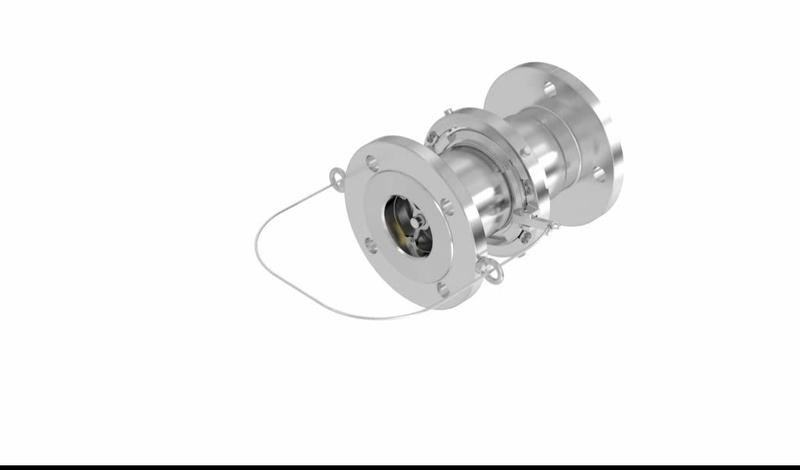 Description Self locking quick connect/disconnect coupling for aviation fuel, to EN 13760 / EN 13175, for the loading and unloading of liquefied petroleum gas LPG and various other media. Pressure Can be coupled up to 10 bar and uncoupled up to 25 bar. Hose unit with swivel, typically mounted on hose assemblies and loading arms for temporary connection to storage tanks and mobile transport units. Pressure Can be coupled up to 10. Description Used to protect hose assemblies and loading arms against excessive loads, e.g. due to drive/pull away incidents or rapid removal of the mobile tanker in emergency situations. Comment Safety Breakaway Couplings eliminate spillage and damage associated with drive and/or pull away incidents when loading and unloading. If the transfer line is subjected to inadvertent and strong tensile loads, e.g. 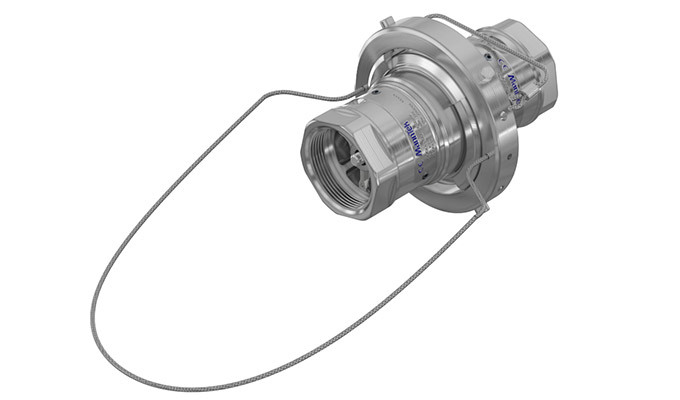 due to a premature movement of road and rail tankers or the drifting of ships, the coupling will separate and instantly seal the two open ends. It can be reassembled on site with a set of spare parts. Drive and/or pull away incidents occur more often than operators might think. Increasing passive safety by using SBC avoids not only serious damages to the environment (e.g. fuel spillage), loading equipment and operators. SBC will also lead to a reduction of down time and other related cost savings, such as the possibility to reduce insurance fees. for working pressure = max. admissible working pressure. Sizes 1" (DN 25) up to 12" (DN 300). Approvals / Certificates SBC fulfill the requirements of European Pressure Equipment Directive category 2 (for higher demand on request). Description Used to protect hose assemblies against excessive loads, e.g. due to pull away incidents or rapid removal of the vessel in emergency situations. 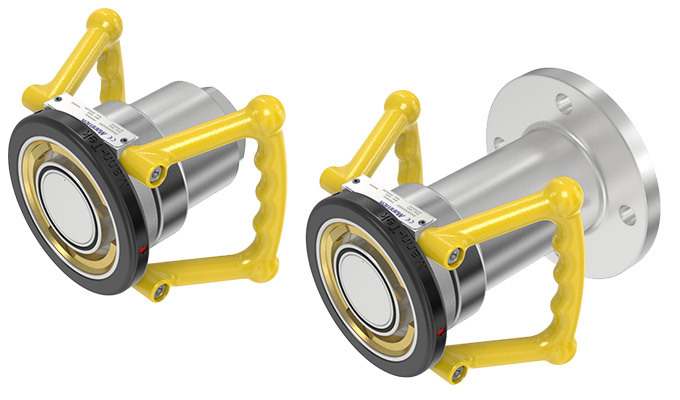 Safety Breakaway Couplings eliminate spillage and damage associated with pull away incidents when loading and unloading. If the transfer line is subjected to inadvertent and strong tensile loads, e.g. due to a premature movement or the drifting of ships/barges, the coupling will separate and instantly seal the two open ends. Described drive and/or pull away incidents happen more often than might imagine. Comment SBC-C eliminate spillage and damage associated with pull away incidents when loading and unloading. 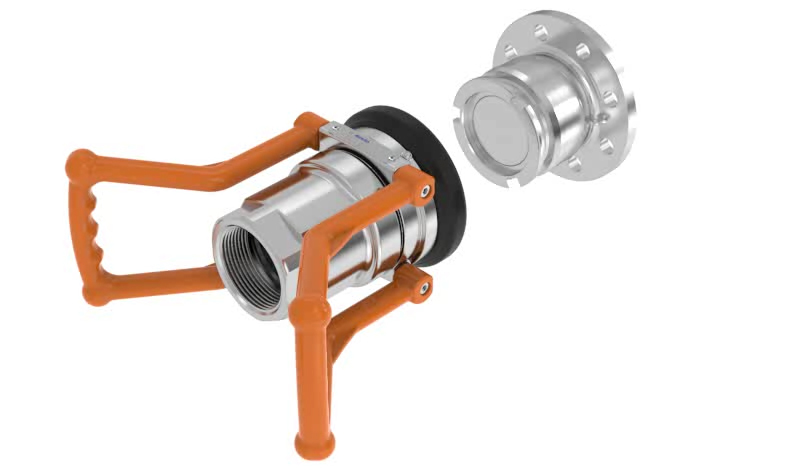 The coupling is designed to protect the weakest link of the hose line or loading arm. If the cable reaches the admitted travel limit and a defined pulling force, the external colllar is pulled off and clamps are actuated ; the coupling will separate and instantly seal the two open ends. There are no loose components which can get lost. After separation the coupling is checked and can be reconnected without spare parts or special tools. Increasing passive safety by using SBC-C avoids not only serious damages to the environment (e.g. fuel spillage), loading equipment and operators. Using SBC will also lead to a reduction of down time and other related cost savings, such as the possibility to reduce insurance fees. Sizes 2" (DN 50) up to 6" (DN 150). Approvals / Certificates SBC-C fulfill the requirements of European Pressure Equipment Directive category 2 (for higher demand on request). 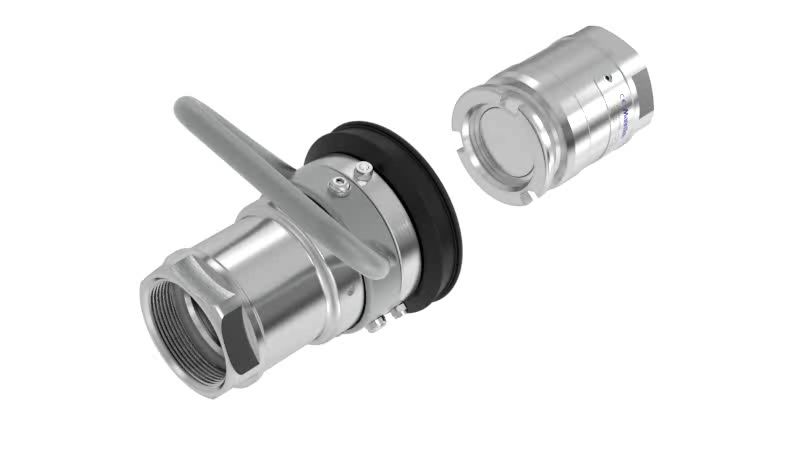 Description Self locking quick connect/disconnect coupling, to PED 2014/68/EU 4.3 and ATEX 2014/34/EU Category 3G, for liquid media and liquefied gases. Sizes 1" (DN 25) up to 2" (DN 50). Pressure Can be coupled up to 10 bar. Working pressure: Stainless steel = PN 16. Description Self locking quick connect/disconnect coupling, to ISO TS 18683. Hose unit with swivel, typically mounted on hose assemblies and loading arms for temporary connection between storage tank and mobile transport units, e.g. for container discharge, fuel bunkering, loading/unloading of tank trucks, rail tankers and ships. Approvals / Certificates CBC fulfill the requirements of European Pressure Equipment Directive category 2 (for higher demand on request). Description Used to protect hose assemblies against excessive loads. Special type, recommended in transfer systems with the combination of high operating pressure and weak piping structure. Approvals / Certificates CBC-C fulfill the requirements of European Pressure Equipment Directive category 2 (for higher demand on request). Sizes 4" (DN 100) up to 8" (DN 200). Approvals / Certificates Type approval DNV GL rules for liquefied gas carriers, type examination DNV GL for LNG transfer systems (ISO16904, EN1474-3).